Replay your favorite classic Pokemon game with awesome new graphics, new animations, and new game mechanics! Choose Bulbasaur and use the power of grass type Pokemon in Pokemon Leaf Green! 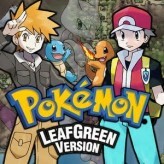 Pokemon Leaf Green is a sister Pokemon version that was released simultaneously to Pokemon Fire Red. The game is based on the classic Pokemon Green from the Game Boy handheld device but features a new game engine, updated graphics, and game mechanics of the Game Boy Advance handheld platform. The game added a lot of new features including mini-games that were never released on the based game. Battle with the Team Rocket, and use the power of the grass type and nature type Pokemon to the limit! Pokemon Leaf Green is an online GBA game that you can play at Emulator Online. This free Game Boy Advance game is the United States of America region version for the USA. Pokemon Leaf Green is a single title from the many adventure games, action games and pokemon games offered for this console. If you enjoyed playing this, then you can find similar games in the gba games category. Pokemon Leaf Green game is from the various retro games on the site, and there are more games like this, including Pokemon X and Y, Pokemon Adventure Green Chapter and Pokemon Fire Red Version.